Nottingham’s Robin Hood statue was unveiled on 24 July 1952 by the Duchess of Portland, Ivy Cavendish-Bentinck, of Welbeck in Nottinghamshire. Click here for a short black and white film of the opening ceremony. It was donated to the city by Nottingham industrialist Philip E F Clay, of Radcliffe-on-Trent near Nottingham, who gave £5,000 to Nottingham City Council. He requested that it should mark the visit of Princess Elizabeth and the Duke of Edinburgh on 28 June 1949, for the 500th anniversary of the 1449 Charter making the Borough of Nottingham into a separate County from Nottinghamshire. The 2.1 metre high bronze statue was sculpted by James Woodford RA, a former student of the Nottingham School of Art, and made by Morris Singer & Co of Basingstoke, Hampshire. It was estimated that it should last for 6,000 years. James Woodford was born in Nottingham in 1894, before moving to London. James also designed Queen Elizabeth’s heraldic beasts which were made especially for the royal approach to Westminster for the Coronation in 1953. The site for the statue, in the dry moat outside the Castle, was chosen in November 1951 by Nottingham City Council for its medieval character and for the legendary association with Robin Hood. The statue stands alone; James Woodford said at the time “Personally I think it would have been too sentimental to put Maid Marian with Robin Hood.” But around the statue are reliefs depicting scenes from the legends; Maid Marian helping Robin and Friar Tuck in their fight against Guy of Gisborne’s men, Richard the Lionheart joining Marian’s hand with Robin’s, Little John and Robin fighting on a bridge and Robin shooting his last arrow. 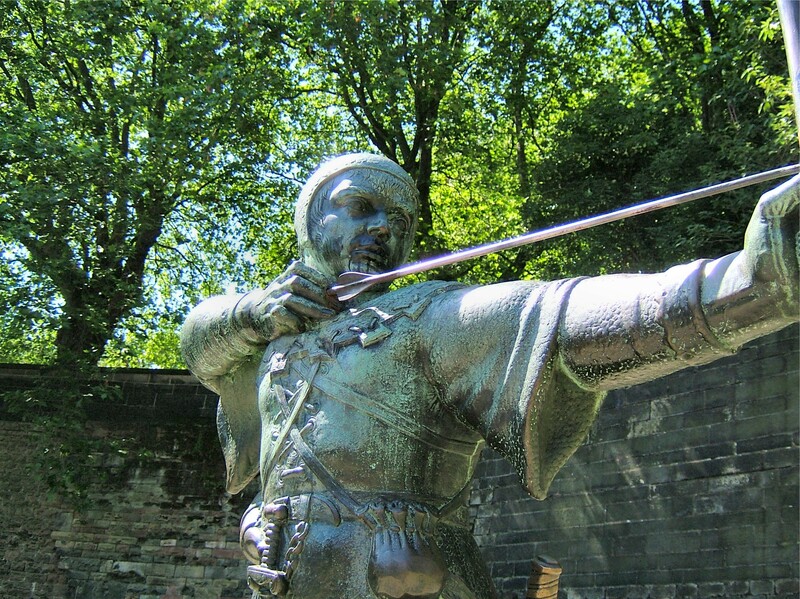 Robin Hood is one of the world’s best known and most enduring legends, the stories attract visitors from all over the world, who come to see the statue and have their photograph taken standing next to it. 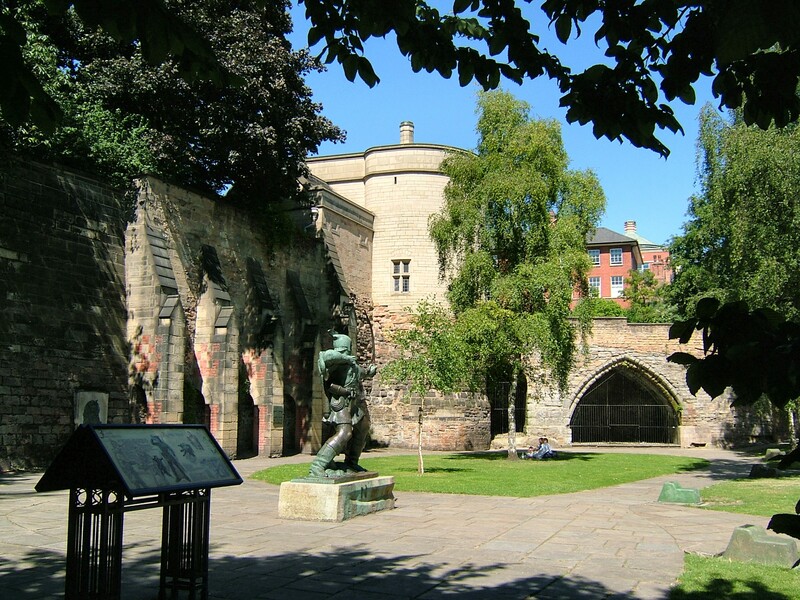 The Robin Hood statue and the Castle Gatehouse are just a few minutes walk along Friar Lane from the Old Market Square. Always loved to watch movies about him. Nice statue and beautiful surroundings. Yes, it’s a pleasant spot; the Castle Gatehouse, or at least the lower part of it, is the largest reamaining part of the original medieval castle.